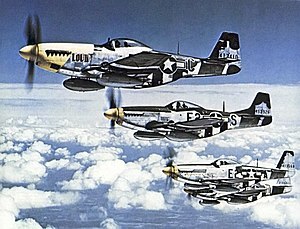 P-51 Mustangs o the 375t Fechter Squadron, Aicht Air Force mid-1944. The North American Aviation P-51 Mustang wis an American lang-range, single-seat fechter an fechter-bomber uised during Warld War II, the Korean War an ither conflicts. ↑ "North American P-51D Mustang." National Museum of the United States Air Force, 2 April 2011. Retrieved: 17 January 2012.